Katherine Uriarte, the daughter of Mexican immigrants, was the first in her family to attend college. In high school, she received fives on six Advanced Placement exams, had a near-perfect GPA, scored extremely high on the American College Testing and participated in a number of high-caliber extracurricular activities. Her resume would have made her an ideal candidate for admission into any of the United States’ greatest universities, but, as she told the LA Times, she was still rejected by UCLA and UC Berkeley for Fall 2015 admission. Like Uriarte — who now attends Columbia University on a full scholarship — many bright Californian students have expressed concern that their residency status is a part of such rejections, specifically pointing to the sharply rising percentages of out-of-state and international students at the University of California. Since 2006, the enrollment of out-of-state and international students has increased by more than 100 percent and 900 percent, respectively. Concern over the changes in enrollment percentages only intensified after a March 2016 state audit showed that, in the three years prior to the report’s release (2012–2015), the grades and test scores of the thousands of newly admitted non-resident students were lower than Californian applicants. Nearly 16,000 out-of-state students, roughly 29 percent of those admitted, gained admission spots to UC schools with lower grade point averages and test scores than the median of admitted California students. Due to the higher tuition rates for out-of-state and international students versus California residents — the tuition for out-of-state students is currently $38,108 versus the in-state tuition of $13,400 — it’s easy to see why the University of California would be running this sort of operation. Still, milking out-of-state and international students like cash cows is a process that has left many in-state students considering higher education outside of California. In response, California lawmakers have forced the UC system to cap the amount of admitted out-of-state and international students, a request the system has begrudgingly accepted with a proposed 20-percent limit system-wide with the exception of UC Berkeley, UCLA and UCSD, where the percentage is to remain at its current respective numbers of 24.4 percent, 22.8 percent and 22.9 percent. The cap will affect the other seven UC campuses uniquely. 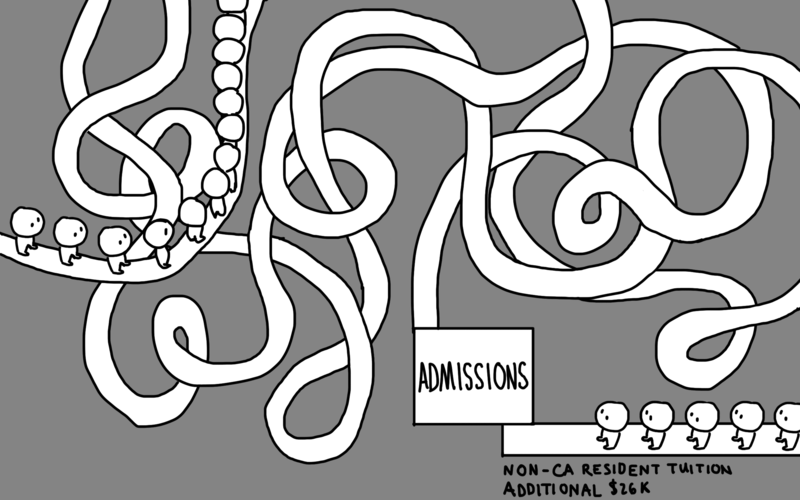 At UC Merced, for example, less than one percent of enrolled students are non-residents. UC President Janet Napolitano has called the state audit prompting the cap “unfounded,” remarking that the accompanied ban will actually harm California’s students. Napolitano argued that the budget constraint is due to a lack of state funding. This is a common argument made by the UC system, but it’s difficult to accept when considering where money is being distributed elsewhere in the university. Pay for UC executives continues to rise while tuition costs increase. At their last pay raise, 15 UC executives — including chancellors and investment officers — all received three-percent salary increases. UCSD’s own Chancellor, Pradeep Khosla, lives in a $10-million mansion paid for by endowment funds and university donations in addition to his $430,000 salary as chancellor. The cap, which has been proposed to the Regents after state lawmakers threatened to withhold $18.5 million in state funding, is a step forward. However, it alone will not necessarily make the UC system more accessible to Californian students academically or financially. It seems as if, like other controversial matters, the UC Board of Regents is merely putting a bandage over a complex issue. Coupled with the fact that the UC system only agreed to this limit at the threat of state funding shows that the UC Regents do not care about California students’ education but rather, making profit. There is no easy solution to gear the UC system more toward California’s students. It’s simple to say that the proposed out-of-state cap will solve all of the problems associated with the UC system, funding and out-of-state students. The argument has been made that the UC system is accepting more out-of-state and international students to collect higher tuition to offset a lack of state funding. According to UC data, state funding accounted for 24 percent of UC revenue in 2000, but only accounted for 10 percent of revenue in 2014. These numbers need to be considered in terms of the entire California state budget, which — due to the economic recession — cut its general fund to 10 percent on higher education in California, where it had been around 25 forty years ago. Fixing such a complex issue is not a simple task. Raising taxes will not be approved by citizens, and a reappropriation of funds must be met with approval by the California state assembly. Although it may not be easy, action must be done by the state in conjunction with the UC system to create a solution for public funding. On University of California’s side, a serious look at spending costs must be made. UC executives, including chancellors, need to examine their own moralities; can they really justify accepting salary increases at the expense of raising tuition costs? There is a serious problem when school officials believe they can comprise university standards to make money off of non-Californian students while simultaneously hampering California students’ chances to attend a university created for accessible education.